The Sansan Open API is a programming interface for working with Sansan. By using the information from the business cards you have gotten, and linking it with other customer information and business information your company has, you can make your information more valuable, and push forward your business. The access permissions when using APIs will depend on the API key given at the time of the request. API keys vary for each user, so by using the API key the user’s access permissions are carried forward. 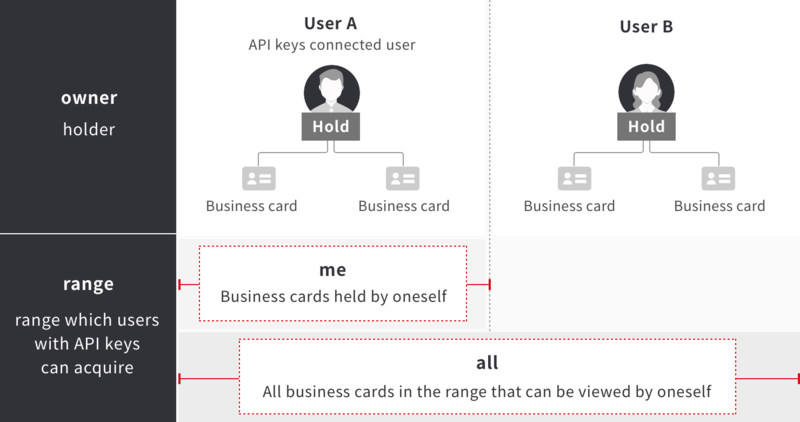 For example, if a user wishes to have access to all the business card data in Sansan from the application, the user who issues the API key must have the same permissions in Sansan. Below are the common specifications for using the API. When making a request to the API, the following common request header is needed. X-Sansan-App-ID is necessary only for applications that have applied for the partner program. There is no common HTTP response header returned by the server. The Sansan Open API follows the rules of RESTful API design. Basically, standard HTTP methods are used to get a business card data resource. For an API using application to access the Sansan Open API, an API key is needed. API keys can be issued by Sansan users, but this user needs to have advance permission to use APIs from the Sansan administrator inside their company. The issuing of API keys can be done from Settings of the upper right menu, or from Administrator Settings, then the screen for Integration with Other Services, and then by selecting API key. The Sansan Open API is set to be called up at most 10 times in a second. Limits for calling up are distributed into each API Key, and if the set limit is exceeded, a special response will be returned. For more details, please see Error Code Chart . Please be aware that the calling up limit is subject to change without prior notice. The Sansan Open API doesn’t allow cross domain HTTP requests. Web browser cannot send requests with XMLHttpRequest to the Sansan Open API directly. Sansan Open API can be used in parallel instances. If an application needs to handle a large amount of information, you can improve performance by doing multiple,concurrent call-ups. However, please be aware that if you use the same API key for the concurrent call-ups, the upper limit for call-ups will apply. Also, if in a certain amount of time an exceedingly high number of process requests are received, please be aware that you may receive a special response that is the same as exceeding the limit for calling up. If an error occurs while using the API, the following HTTP status codes will be returned. For some status codes, the error object arrangement, which shows the details of the error, will be returned. Status codes not written below (for example 200 or 203) conform to HTTP specifications. 429 too_many_request Request amount exceeds limit. The Sansan Open API will return the business card resource in the JSON format. To be more specific, it will be returned like this. Requests that may return many collections/arrays, such as business card information, have a limited number of items per response. This is set with a limit (default of 100) on the number of acquisitions. Each response also contains a hasMore property and nextPageToken property. If hasMore is true, specify nextPageToken as a request parameter and continue. Please also note that nextPageToken expires 6 hours after requesting the first page. Business cards have the following statuses. The related time-stamp can be used to sort. Users who have business cards or tags are called holders. The range of business cards that can be acquired can be specified as “me” (only the cards held by oneself) or as “all” (all the cards within the range that can be viewed by oneself). Regarding the range that cannot be viewed by the holder, please see the help pages below. When two cards are determined to be from the same person, they are collated together. The card with the more recent date received will be the most recent card. With the Business Card API you will only have access to the business card information held by your company in Sansan. Please be aware that you cannot access the business card information of other Sansan clients. List object which contains BizCard object as data. The order of the business cards is descending order of the data registered. This will acquire a set of business card based on a specified term. The order of the business cards (Data below data key) is descending order of the data registered. This is a token for acquring the search results from the next page. If a token is specified, it will inherit the values ​​of other parameters specified when issuing it. This includes previous business card information. Properties to be used for the order of business cards included in the response. Upper limit for list to be acquired from 1 to 300 can be specified. List object which contains BizCard object as data. The order of BizCard object is descending order of the data registered. This will acquire a set of business cards based on specified conditions. The order of business cards ( data under the data key) is descending order of the data registered. string (optional) Example: ABC Electric, inc. Partial match search for Company Name is Sansan. Prefix match search for person in Sansan. Complete match search for Email in Sansan. Partial match search for Telephone Number in Sansan. Partial match search for Mobile Phone Number in Sansan. Order of business cards included in the response. "description": "Data Card Received, format: YYYY-MM-DD"
"description": "Data Card Registered, format: YYYY-MM-DDThh:mm:ssTZD"
"description": "Data Card Updated, format: YYYY-MM-DDThh:mm:ssTZD"
"description": "User object which shows the holder"
"description": "Last Name spelled in Japanese Kana"
"description": "First Name spelled in Japanese Kana"
"description": "Country code (ISO 3166-1 alpha-2 format)"
"description": "Address. String concatenate prefecture, city, street address and building." "description": "Memo attached to business card"
"description": "Processing: This business card is currently being processed. completed: The data entry for this business card is completed. unreadable: This business card could not be processed." "description": "Is this a user created business card? true: business card created by a user or business card import. false: business card created via scanner or software that has been digitized by Sansan." Return a business card which holds the specified Business Card ID. If the business card in question is recognized as being from the same person within the cards of one business card holder, business card displaying the most recent business card resulting from the same person identification will be returned. In this case, the Business card ID specified in the parameters will be different from the ID of business card returned. Image data of the business card in JPEG format. The image data of the business card with the specified BizCard ID will be returned in JPEG format. Business cards have images of both the front and the reverse of the card. You can specify which side’s image to retrieve with side parameters. List object which contains Tag object as data. This will acquire a set of tag assigned to a specified business card. With the Person API you will only have access to the business card information held by your company in Sansan. Please be aware that you cannot access the business card information of other Sansan clients. "description": "Business card object which shows main information about this person." Information about the person specified by the Person ID will be acquired. If this business card has been identified as the same person as another, the BizCard object displaying the most recent business card resulting from the same person identification will be returned. With the Tag API you will only have access to the business card information held by your company in Sansan. Please be aware that you cannot access the business card information of other Sansan clients. Acquires a tag list in Sansan. Multiple specifications for tag types. Multiple specifications are possible. This is an object used in the organization API that represents a user. (Required when adding users) This is the temporary identifier used when adding users. ・The same TempId cannot be used more than once in one CSV. ・When acquiring users, this will be output as blank. ・When editing users, this is left blank. (Required when editing users) This is the identifier to uniquely identify a user in Sansan. ・When adding users, this is left blank. ・When editing users, this will specify the ID generated when the user was added. (required) This is the identifier for the department that the user belongs to. ・By using semicolons (;) as separators, multiple departments can be specified. ・If this person will be put into an existing department, please specify the DepartmentId. ・If this person will be put into a new department, please specify the TempId. (required) This is the identifier for display that uniquely identifies a user in Sansan. ・After adding, this cannot be changed. (required) This is the user’s name. (optional) This can use be used for alternative names or foreign language names (e.g. Chinese names). Foreign alphabets and characters may be used. This name can be used for searching and will appear on profiles. (required) This is the user’s email address. ・The same email address cannot be specified more than once in one company. (optional) This is the user’s sub-email address. (Required when adding users) This is the date when Sansan usage started. ・This must be the present day or a day in the future. ・This cannot be changed after usage has begun. ・When this is acquired with the Acquire user API, hyphens (-) will be used as separators. ・If this is blank when editing users, no change will be made. (optional) This is the display language when using Sansan. ・For Chinese (simplified), input 2. ・If this is blank when adding users, the display language of the user executing the API will be input. (optional) This is the format for receiving emails. ・If this is blank when adding users, it will be set to HTML. (optional) This is the identifier used for AD linking. ・Within the same company, the same AD linking ID can only be used once. (optional) This is the user type. ・To give regular user permission, input 0. ・To give system administrator permission, input 1. ・To give sectional administrator permission, input 2. ・If this is blank when adding users, regular user permission will be given. (optional) This is the permission to update all data. ・Input 1 to give this permission. ・Input 0 to not give this permission. ・If this is blank when adding users, permission will not be given. (optional) This is the permission to download business cards and reports. ・To give permission to download only My data, input 1. ・To give permission to download all data, input 2. (optional) This is the permission to use email delivery. SalesforceIntegrationPrivilege - This is the permission to link business card data with Salesforce. (optional) This is the permission to use Deal management. ・To given usage permission as a regular user, input 1. ・To give administrator permission, input 2. (optional) This is the permission to use API linking. (optional) This is the permission to check actual usage of Sansan. (optional) Input “1” to give this permission. (optional) This is the flag used to delete users. ・To delete a user, input 1. ・If this is blank when adding users, the user will not be deleted. This is an object used in the organization API that represents a department. (Required when adding departments) This is the temporary identifier used when adding departments. ・When acquiring departments, this will be output as blank. ・When editing departments, this will be blank. (Required when editing departments) This is the department identifier. ・When editing departments, this will specify the ID generated when the department was added. ・When adding departments, this will be blank. (required) This is the department’s name. (optional) If the department’s name is not written alphabetically (e.g. in Chinese), you can enter the phonetic alphabetic reading of the name here. (optional) This is the identifier for a parent department (a department that is placed higher in a hierarchy). ・If an existing department will be made into a parent department, please specify the DepartmentId. ・If a new department will be made into a parent department, please specify the TempId. ・If there is no parent department, this will be blank. (optional) This is the display order of the department. (optional) This is the flag used to delete departments. ・To delete a department, input 1. ・If there is a department under this department, it cannot be deleted. ・If there is a user in the department, the department cannot be deleted. This is an object that represents the results of an organization import. ・If this is a department, input 0. ・If this is a user, input 1. (optional) This is the identifier that specifies the original data. ・If this is an existing department or user, the requested value will be set. ・If this is a new department or user, the ID generated when Completed is true will be set. (optional) This is the temporary identifier used when adding users or departments. ・The requested value will be set. (required) This is the result of the organization import. ・If the organization import is successful, then true. ・If the organization import failed, then false. ・If Completed is false, then the details of the error will be set. ・If multiple errors occur in one department or one user, the details of the errors will be set, separated by semicolons (;). With the Organization API, you can access department information and user information of your own company in Sansan. This can only be used by system administrators. The user object will be returned in CSV format. This will acquire users registered in Sansan. The response will be returned in CSV format (without headers). The department object will be returned in CSV format. This will acquire departments registered in Sansan. The response will be returned in CSV format (without headers). "description": "Unique UUID to specify the reservation"
This will make a reservation to import departments and users. Departments and users can be imported separately. When the import begins, the department data and user data will be checked, and if there is an error in even one line, then the import processing will not be executed. When a department is added, a DepartmentId is generated. When a user is added, a UserUuid is generated. When editing departments or users, the above IDs that were generated are necessary, so when the import is complete, do not forget to use Acquire organization import results to acquire the IDs. To specify the Organization import reservation generated by this API, please keep track of the importID. The CSV file will be sent as multi-part. The same discretionary boundary character string will be set for the request header and the request body. This will comply with RFC7578. However, a line feed code (CR+LF) is always required at the end of the request body. For data types, department data will be set as department, and user data will be set as user. The contents of the CSV for the department data will be a department object, and for the user data will be a user object. If all of the data is correct, the response body will be returned blank. If there is an error, the Organization import result object will be returned in CSV format. This will check, in advance, the department data and the user data to be imported. It is possible to check the department data and the user data separately. If there is an error in the department data, the user data cannot be checked. "description": "This value shows the status. '0' is reserved, '1' is currently being done, '2' is complete, and '9' is error." This will check the status of the organization import. If the status is 2 (complete) or 9 (error), please use Acquire organization import results to acquire the results. The UUID generated by the organization import reservation. This will acquire the results of the organization import. The will results can only be acquired if the organization import status is 2 (complete) or 9 (error). The response will be a CSV file (without headers). The Management API enables access to individual users’ Settings, Admin Settings, and other information. This function is only available to the system administrator. For emailClient, specify clientSoftware, gmail, or office365. After selecting clientSoftware, in the encoding request, choose UTF8 (recommended), SJIS, ISO2022JP, or none. This setting is not needed for Gmail or Office365. The specific settings are returned. Defaults for email software can be set to be applied to new users after initial setup. These are the initial settings, which users can later change. Specific settings are returned when the initial settings are not established for the email software. The current email software settings will be used as initial values. The Partner Program is a program for companies that provide “Business applications” integrated with the Sansan API. If you would like to become a partner, please contact us from here. If authorized as a partner, an Application ID will be issued to identify where requests are coming from. This is information that specifies which application that requests are coming from to the Sansan Open API. This is necessary for applications that have applied for the partner program.